MY ten-month-old has been swaddled since he was born and still won't settle unless he is tightly wrapped. Now he’s getting big he’s unravelling herself at night and is waking up. Any ideas how I can wean her off being swaddled? Babies love being swaddled or wrapped, it starts because they are so tightly confined in the womb and if you swaddle when they are born they feel snug and secure and it helps them to sleep. 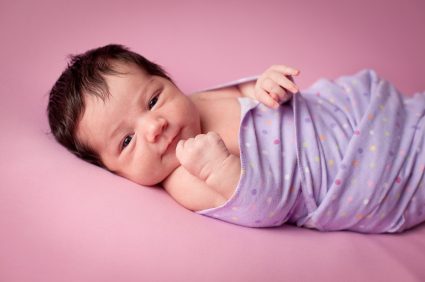 The other benefit of swaddling is that babies have a startle reflex in the early months of life where their arms jerk outwards and wake them up if sleeping. When wrapped snugly as this reflex happens it really is just a little shudder and is unlikely to wake your baby. We also know that what you do to your baby as they go to sleep becomes their sleeping cues. Thus the problem you now have. Because your baby drifts off to sleep being wrapped then this is what he has become dependant on to sleep, thus now that he is bigger and wriggling around and the wrap becomes looser. Then when he half wakes at the end of his sleep cycles he realises that the cue of wrapping is missing to get back to sleep. Thus he thinks he can’t sleep without being wrapped and calls you in to re-wrap him. I can give you two options to help wean him off his wrap. The first one is to start day by day making his wrap a tiny bit looser when you first wrap him to go to sleep. Every day continue to loosen it so that before the end of a couple of weeks it is really just loosely tucked around him. This is a gentle way to change his sleeping cues. Second option is to replace his wrap with a sleeping bag, straight away. Make sure that the thickness of the sleeping bag is appropriate for your weather and season. He is going to struggle to sleep for about a week and become increasingly overtired however with the absence of the wrap he will soon cue in being zipped into his sleeping bag as his new cue. Alternatively you can do both, put him in his sleeping bag and wrap him over the top – this is called ‘pairing’. Again do the wrap looser and looser until it is basically a sheet and then remove altogether. From a safety point of view, once he is getting out of the wrap and it is loose in his cot, then according to SIDS recommendations it should be removed altogether. Try either of these suggestions and please don’t in the meantime go in to rewrap him, it won’t be long before his wrap is in the past. I suggest to parents that they wrap but move to a sleeping bag by 12 weeks of age to avoid this problem and for safety reasons.